Distillery Plant Manufacturers in Pune, India. Production & consumption of alcohol is an age old practice. But with time, the usage areas as well as production techniques have gone through a major transformation. Apart from potable purposes, alcohol today finds application in a varied mix of industrial areas. And with state-of the-art technology, we now have techniques & systems that bring out much higher quality of the product while effectively lowering production costs. The process of distillation is one with slow dynamics and is accompanied by side streams, making it essential to have a carefully planned and designed control system. Raj Process Equipments designs and executes the state of art Industrial Alcohol Plants Manufacturers in India for distillaries right from fermentation, distillation and evaporation with unique zero liquid discharge guarantee. Industrial Alcohol Plants Manufacturers in India are engineered for high yield and low cost for optimizing the profits. 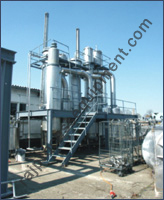 Raj Process Equipments are ultimate in Potable Alcohol Plants Manufacturers India for alcohols for human consumption. each stage is as sensitive and volatile as other. The size and design of Potable Alcohol Plants Manufacturers India are finalised after due consideration to every minute ditail. 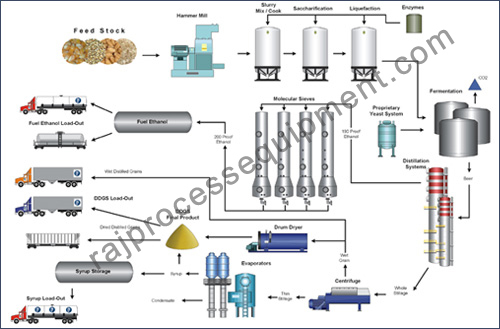 Fermentation processes for cane molasses, juice and grain. Evaporator and Dryer for distillery effluents. Our Fermentation system design based on crucial parameters which helps to reduce loses of alcohol in fermentors and increase the yeild of alcohol by controlling the unwanted byproducts. Fermentation systems for alcohol production are designed to handle a verity of feed stock. eliminating need for expensive yeast separators. syncronised mode of operations, depending on characteristics of feed stock. We offer separation technologies with higher efficient multiple distillation column systems. Which operate at lower energy consumption, Higher yield. State of art in plant automation. Molecular sieve dehydration plant design based on pressure swing adsorption with thermal heating to maintain quality norms with advantages. Higher desiccant (Molecular Sieve) life. RAJ Zero liquid Discharge Technology provide the most comprehensive, cost-effective and reliable operating systems and services. These products and services are designed to help keep your plant safe, or your company profitable. The Evaporation System consists of single or multiple calendrias (Tubular shell and tube heat exchangers) followed by drying systems. Evaporation systems are designed with consideration of higher fouling fluids, rugged operation, less maintenance and operating cost, easily stable with fluctuation on steam or feed side. For drying we offer rotary and spary dryer considering the suitability and nature of the product to be handle. The dryers are highly efficient having low operating costs and easy to operate. These dryers are highly effective for products, which required gentle drying and higher residence time. Enhance water and waste minimization. Operated under vacuum or pressure. Fully automated systems to ensure consistent product quality. Process fluids with higher viscosities and also be handled effectively. No loss in production time. Comparatively less maintenance and operating cost. Low temperature drying which maintain quality of product. Fully automatic systems to ensure smooth and ease of operation. Due to radiation and conduction effects, the moisture get evaporated and product becomes progressively dry as it travels across the dryer and reaches the final moisture level at discharge point. Handling granular, free flowing solids. Uniform drying and cooling action with higher evaporation rates. Continuous operation with compact installations.